Let's say you want to sell a product that can simultaneously bill a customer each month, create a new order for them, and then schedule another order that's due a month later. And do it all automatically each month. Welcome to Subscription Products 101. This tutorial will review the basics of creating subscription products in the Modular Merchant shopping cart software and provide examples of some of the most common scenarios. This article refers often to sections of the Product Editor. It's assumed that the reader is already familiar with the basics of creating a product in the Product Editor. If not, go create a few products in your store to get comfortable with it, then come back. This article will focus on the section of the Product Editor named Subscription Rules. When a subscription is processed, an order is created. Products can have rules assigned to them that create a subscription for the customer when a product is purchased in the store. To create products that have automated recurring billing rules, start with the Subscription Rules section of the Product Editor. This is where the rules that control a product's recurring billing are set. If this option is selected from the menu, then the product will neither create nor update a subscription for the customer when it is purchased. This option will schedule a subscription that repeats a specified number of days. Selecting this option will display another field in which to enter the specified number of days. · June 1st: Initial purchase by the customer. · July 1st: First automated order generated by the subscription. · July 31st: Second automated order generated by the subscription. · August 30th: Third automated order generated by the subscription. This option will schedule a subscription that repeats on the same day of the month, week or year that the original order was placed. Selecting this option will display another field in which to enter the type of anniversary. · August 1st: Second automated order generated by the subscription. · September 1st: Third automated order generated by the subscription. This option will schedule a subscription that repeats on a customized schedule, based on the product's original purchase date. Selecting this option will display several more fields in which to customize the subscription's schedule. 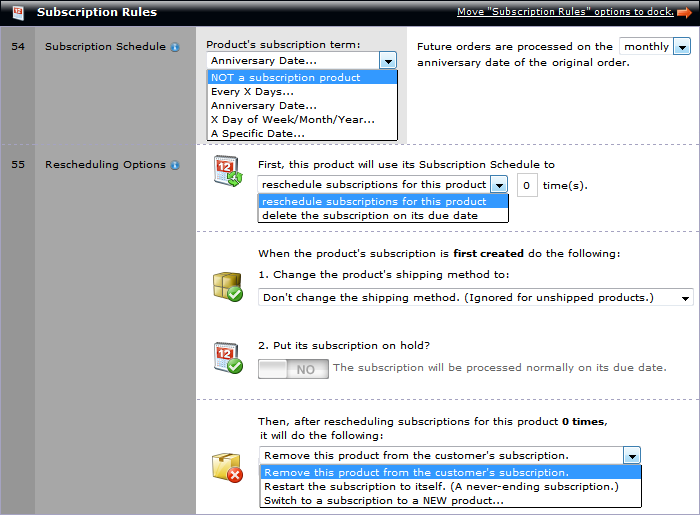 This option will schedule a subscription that occurs on a specific date in the future. Selecting this option will display another field in which to enter the specified bill date. The option for A Specific Date has its very own tutorial that describes each of its options, and includes an example of how it can be used. For an example of using this setting, refer to the article titled sell a product that bills on a future date. First, this product will use its Subscription Schedule to reschedule subscriptions for this product X time(s). Every time a product with subscription rules is purchased — either by a customer in the storefront or automatically as part of a scheduled subscription — the product will first check to see how many times it has left to rebill as itself before moving on to the next setting in the Rescheduling Options. The value of this field can be any number, even zero. After a customer's subscription to this product has been billed this many times, it will then move on to the next option. If a product that rebills as itself 500 times is purchased today, then the customer's next 500 orders generated by their subscription will all be for this product. After the subscription has been processed 500 times, the customer's next subscription will be determined by the rules established in the then, it will do the following setting. If a product that rebills as itself 1 times is purchased today, then the customer's next order generated by their subscription will all be for this product. After that, the customer's future subscriptions will be determined by the rules established in the then, it will do the following setting. If a product that rebills as itself 0 times is purchased today, then the customer's very next order generated by the subscription will be determined by the rules established in the then, it will do the following setting. If the subscription product is set to be deleted on its due date, it will be removed without feedback on that date, and will not move onto any other Rescheduling Options. · January 1st: Initial purchase by the customer. · January 15th: Product is deleted from the customer's subscription. The options in this section will be used every time a subscription to this product is first created, as well as each time it restarts the subscription to itself. This option can change, remove, or keep the shipping method the same every time the subscription is first created/restarts as itself. A dropdown menu is displayed, including all of the store's shipping methods. There are also options to keep the shipping method the same or remove it entirely. Put its subscription on hold? A toggle button controls whether or not the subscription will be put on hold when it is first created/restarts as itself. · The subscription will be put on hold when it is first created/restarts as itself. · The subscription will not be put on hold. If this option is selected, then the customer's subscription to this product will be removed. No future orders will be scheduled, and the customer will not be billed again in the future for this subscription. If the customer has subscriptions to other products, those will not be affected. This is a simple way to create a subscription that continues indefinitely. Even if the product's rebill as itself field is set to zero, selecting this option will set the product to continue recreating a subscription to the product each time the customer's subscription is processed. When this option is selected, an additional field will be displayed in which to enter the SID number of a desired product. After this product has rebilled as itself the specified number of times, it will then switch over to the new product. When that happens, the Subscription Schedule for the customer's subscription will also switch to the new product's schedule. The settings in the Subscription Rules section of the Product Editor can be used to create a wide variety of products with automated recurring billing. Examples of Subscription Rules for accomplishing specific scenarios are also available in the Subscription Products FAQs & Tutorials section of the Knowledge Base. And, if there's a specific scenario that you don't see an example for, just let us know, and we'll be happy to document it!